On Thursday, the U.S. Department of Agriculture released its 10-year projections for the food and agriculture sector. The report noted that, “Over the next several years, the agricultural sector continues to adjust to lower prices for most farm commodities. 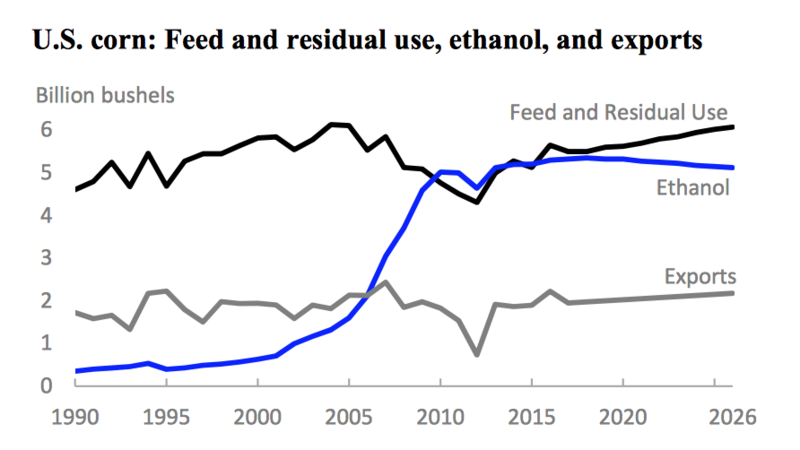 Although reduced energy prices have decreased energy-related agricultural production costs, lower crop prices result in declines in planted acreage. 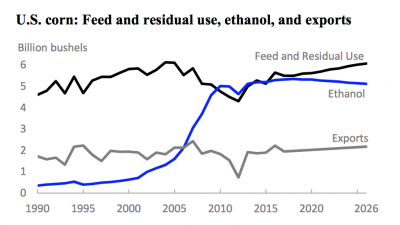 Lower feed costs provide economic incentives for expansion in the livestock sector.” Today’s update highlights aspects of the report that focused on corn and soybeans. Corn exports will be boosted by increased incomes and additional demand for protein from developing countries that use corn for feeding livestock. Graph from, “USDA Long-term Projections,” February 2017. Increasing competition, particularly from Brazil, Argentina, and Ukraine, results in a declining U.S. share of global corn trade over the projection period. For the 2017-2018 marketing year, USDA pointed to an estimate of 90 million acres of corn planted in the U.S. with a projected yield of 170.8 bushels per acre resulting in a farm price of $3.30. 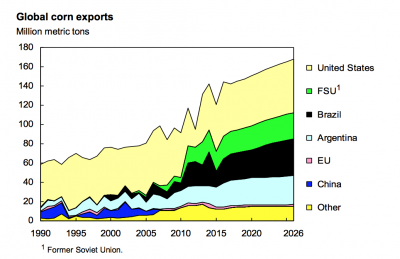 Strong global demand for soybeans—particularly in China—boosts U.S. soybean trade over the projection period. 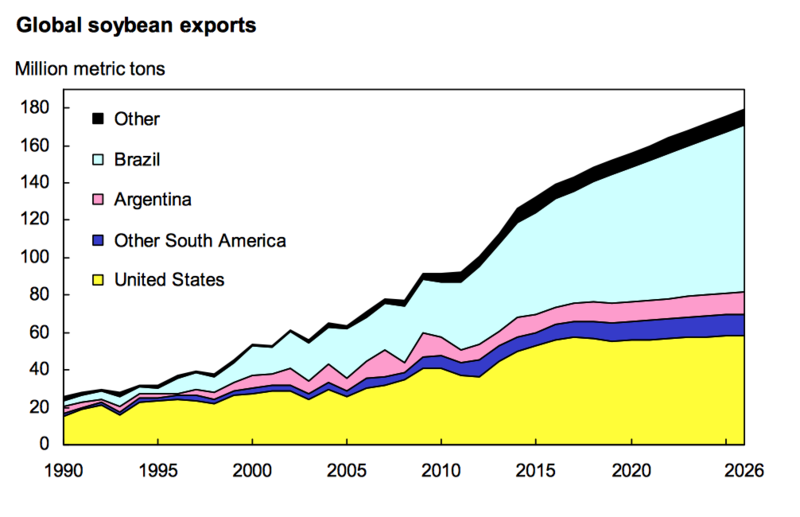 While soybean exports are projected to rise, competition from South America—primarily Brazil—will lead to a reduced U.S. share of global soybean trade. Increased demand for soybeans from China, and strong demand for domestic soybean products, provide a small lift to nominal soybean prices over the projection period. For the 2017-2018 marketing year, USDA pointed to an estimate of 85.5 acres of soybeans planted in the U.S. with a projected yield of 47.9 bushels per acre resulting in a farm price of $9.35. 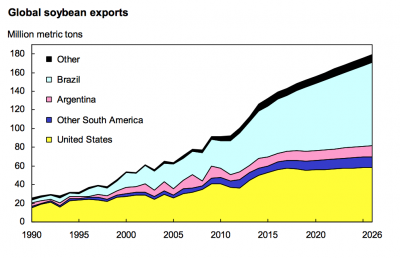 The three leading soybean exporters—the United States, Brazil, and Argentina—are projected to account for about 89 percent of world soybean trade over the next decade.